Thisismytheatre return by popular demand, performing Shakespeare’s Macbeth. If you haven’t yet seen these talented and versatile actors, up close and personal, who make you feel part of the performance rather than mere observers, then don’t miss this opportunity! For our retuning regulars, we know what to expect – an enjoyable evening of West End quality theatre, right here in St Mary’s Church. Using the play’s original language in combination with traditional Celtic music played live, choral song and modern characterisation, this beautiful one-act adaptation will captivate audiences of all ages. 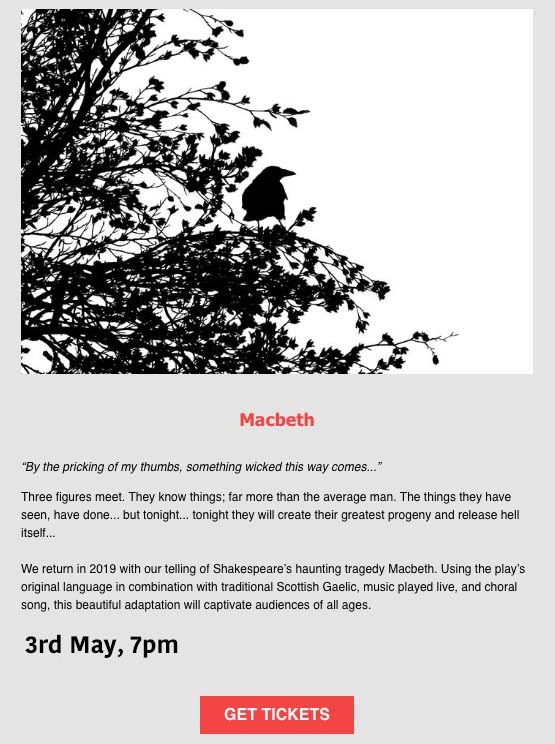 This entry was posted in Events and tagged Macbeth, St Mary’s Church, thisismytheatre. Bookmark the permalink.